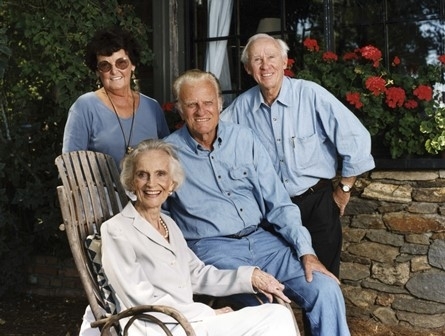 CHARLOTTE, NC (ANS — Nov. 16, 2017) – Russ Busby, who spent six decades traveling the world as evangelist Billy Graham’s photographer, passed away on Tuesday, November 14, 2017, at his son’s home in California following a long illness. He was 86. Busby joined the Billy Graham Evangelistic Association (BGEA) in 1956 when Graham held a Crusade in Oklahoma City, Oklahoma. Busby managed a local photography studio, and he tracked the Graham team down in their hotel to show them examples of his work. Soon he was a part of the ministry, traveling to dozens of countries over the ensuing decades as he photographed Graham with everybody from presidents and kings to survivors of natural disasters. According to a BGEA news release, President Lyndon B. Johnson, at one point, offered Busby a job as the official White House photographer, but Busby declined saying that he felt called to serve the Billy Graham Evangelistic Association. “He traveled all around the world with my father, taking countless historic shots, and continued to provide photography for ministry events and my Crusades even after my father was no longer able to travel. Russ was a valued member of the team and a wonderful friend of the family,” said Franklin Graham, president of the Billy Graham Evangelistic Association, who was just four years old when Busby began working with the ministry. Busby’s images of Graham speaking to hundreds of thousands of spiritually-hungry people have become iconic; particularly his 1973 shot of more than one million people in Seoul, South Korea (the largest one-day attendance in Graham’s Crusade ministry), and his 1985 pictures of people filling the streets and perched atop buildings as Graham preached the Gospel behind the Iron Curtain in Romania. Busby’s pictures have been used on the covers of books, magazines and newspapers around the world. His lasting impact can be seen in Billy Graham: God’s Ambassador, his collection of images first released in 1999. “The legacy of Russ Busby is cherished in our hearts and memories. He will be missed but never forgotten,” said Franklin Graham. Busby was preceded in death by his wife of more than 50 years, Doris, his son Bruce, and his daughter Carolyn. He leaves behind his son Dan, his daughter Becky, and numerous grandchildren and great-grandchildren. Funeral arrangements are pending at this time. Note To Editors: Pictures of Russ Busby are available for download and use at https://bgea.box.com/v/RussBusby. A personal note from Dan Wooding: In my nearly 50 years in journalism, I’ve worked with many talented photographers, but Russ Busby was not only the best, but also the most charming. I marveled at his professionalism when we worked together in Moscow, Russia; Essen, Germany; and San Juan, Puerto Rico, during Mr. Graham’s crusades there, and also during the funeral of both Pat Nixon, and a year later, that of Richard Nixon, where I stood next to five US Presidents in the grounds of the Richard Nixon Library in Yorba Linda, California. He took a picture of this, but I can’t find it. His wonderful smile was a joy to behold, and often he would take pictures of me at work in the media room at the various Billy Graham crusades that I worked on with PR supremo, A. Larry Ross, writing many of the news releases. I am trying to now picture him with a camera slung around his neck as he is welcomed into heaven. I’d love to see the kind of pictures he will be taking there. Now, that would be an exclusive. Photo captions: 1) Russ Busby with Billy Graham at Mr. Graham’s home in Montreat, NC. 2) Billy Graham’s largest Crusade was in Seoul, Korea (Yoida Plaza) with 1.1 million people attending at one time. The Crusade ran for five days, with Mr. Graham preaching to more than 3 million people total. (Photo: Russ Busby). 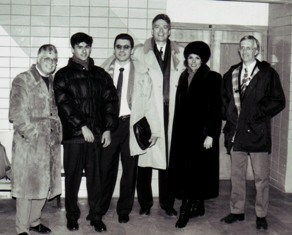 3) The Billy Graham media team in Moscow with Dan on the left. (Photo: Russ Busby) 4) A Russ Busby picture of Dan Wooding, A. Larry Ross and the rest of media team in San Juan, Puerto Rico. About the writer: Dan Wooding, 76, is an award-winning author, broadcaster and journalist, who was born in Nigeria, West Africa, of British missionary parents, Alfred and Anne Wooding, who then worked with the Sudan Interior Mission, now known as SIM. Dan now lives in Southern California with his wife Norma, to whom he has been married for some 54 years. They have two sons, Andrew and Peter, and six grandchildren who all live in the UK. Dan is the founder/president of the ASSIST News Service (ANS), and is also the author of numerous books. He has a radio show and two television programs, all based in Southern California. Dan’s life story is now being turned into a Hollywood movie.